Jaw Crushers are used extensively throughout the world by the aggregate, mining and recycle industries. Their large physical size and rectangular feed opening enable them to receive a larger feed size than most other types of crushers. Rugged construction, simplicity of design and the ability to crush most types of material, including hard abrasive stone, make them ideally suited for use as the primary crusher within a crushing circuit. This style of crusher uses compression to crush rock by squeezing it between two jaws: one stationary and one movable. 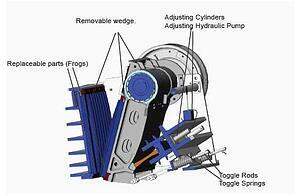 The movable jaw (Pitman) is attached to an eccentric shaft that causes it to move in a reciprocating motion. 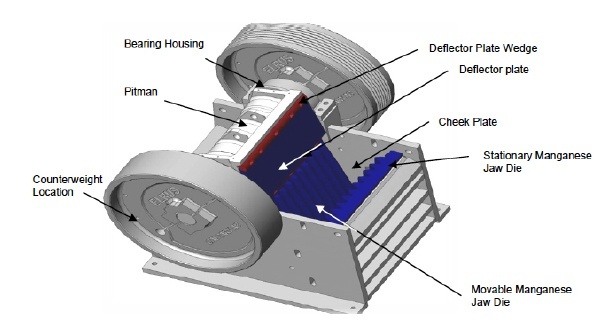 Rock enters the crushing chamber from the top and moves through the chamber, which gets narrower as it gets deeper, until it is caught between the two jaws, where it is squeezed until it fractures. 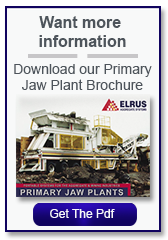 ELRUS manufactures Single Toggle, Heavy Duty Overhead Eccentric Jaw Crushers. Designed and engineered to exacting specifications, they feature manufactured heavy duty jaw boxes and cast pitmans that are ruggedly built and stress relieved before final machining. 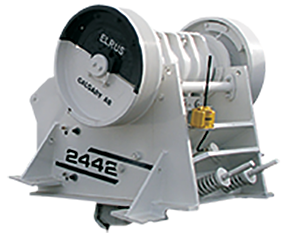 ELRUS jaws crushers are available in sizes: 1536, 2036, 2236, 2442, 2054, 3042, and 3054.
construction 2-2.” steel plate welded con struction which has been stress relieved to ensure a long trouble free life. 1 3/4"-2.” cast steel construction which has been machined to give a closely toleranced fit with other components. The pitman also features a replaceable plate to help protect the barrel from damage due to oversize or slab type material. One piece cast flywheels in 48” or 60” diameter sizes. Hydraulic Jaw Adjust with Shims Jaw crusher settings can be easily changed with our standard hydraulic pump used to take the pressure off. This allows you to add or remove shims as needed for the correct setting.